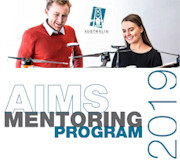 AIMS invites all Western Australia 1st and 2nd year graduates to apply for the 2019 Mentoring Program. The program invites recently employed Graduates* or Mine Surveyors new to the industry to apply to the mentoring program where they are paired with appropriate mentors, meeting on a monthly basis for six months. The program cost is $450 which covers the cost of AIMS membership, sun downers and gala dinner for both Graduates and Mentors. An invoice will be issued after acceptance into the program. The program will aim to provide graduates with a better understanding of the pathway to authorisation, as well as working on personal development goals enhancing their strengths and identifying areas of improvement. Graduates will have gained a better understanding of best practice in mine surveying and modern technology and will benefit from a broadening of their network of experienced Mine Surveyors they can call on for advice. Mentors in turn also benefit by passing on their knowledge and experience onto the next generation, whilst building on their own management and coaching skills. On completion of the program there will be a networking event for all Graduates, Mentors and Sponsors to get together.